David D. Jones was born to Grace Harris and Benjamin Jones on January 27, 1965, at Webb Airforce Base. He was the second youngest of six siblings. His brothers B.J., Darryl, and Terrence all preceded him in death. 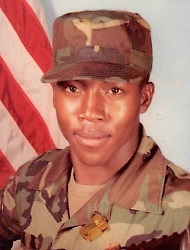 After graduating from Sam Houston High School, he served in the Army Reserves. He worked in Alaska as a security guard and did construction work in Kansas. David leaves to cherish his memories his loving and caring mother, Grace Jones; brother, Gerald Jones; sister, Debbie Shepard; four children, Stephon Jones, Kwanisha Jones, Imani Jo Jones, and Davina Grace Jones; and a host of other family and friends.